Ever visited a wedding dress trunk show? 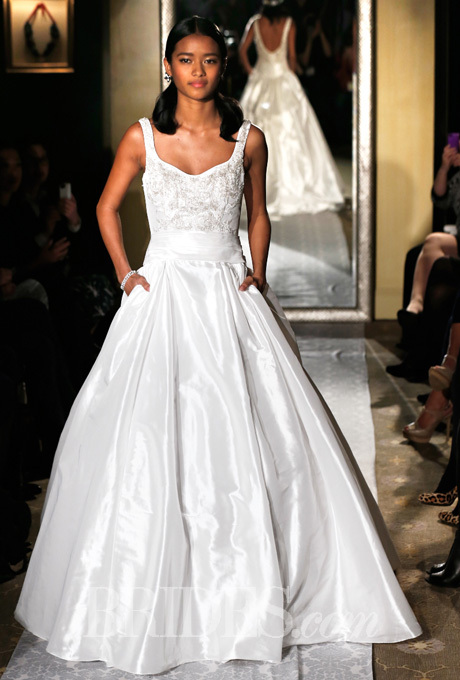 You can thank designer Oleg Cassini for the experience! Considered the inventor of licensing, it was not until he became the “secretary of fashion” for first lady Jackie Kennedy that store owners wanted him to come to their establishments. Cassini himself explained in a 2003 interview that traditionally, designers simply would not come to stores and that they were usually pretty private. But, he explained, after three martinis before every show, he was ready to meet with the brides! For the last few decades, Cassini’s wedding dresses have been one of the most popular labels. The intricacy of his wedding dresses are reminiscent of his intricate and interesting life. 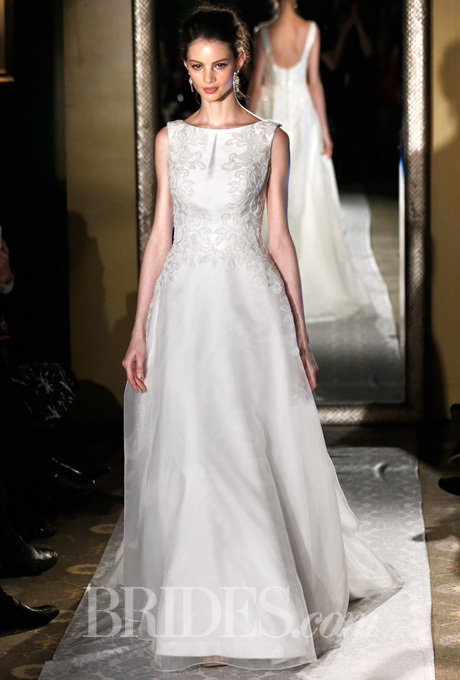 This Spring 2015 Oleg Cassini wedding dress looks great on the runway. Courtesy of Brides. Cassini’s story is one of riches to rags to riches. As a child in Russia, his mother was a countess and his father a Russian diplomat. He lived very comfortably but after witnessing two cousins getting killed by the Bolsheviks, his family decided to flee. The Russian revolution prompted the Cassini family to move to Florence where his mother designed clothes and established a flourishing business. Because Cassini’s father had been an ambassador in the United States, American friends soon began to shop there. These American connections would prove important in later years as Cassini sought clients. Interestingly, Cassini studied Political Science at the University of Florence and became a successful equestrian. He studied fine art under painter Giorgio de Chirico at the Accademia di Belle Arti Firenze. Later, he entered the fashion industry and studied under the French couturier, Jean Patou. Cassini’s devotion to the USA was also apparent in his connection to cowboys. After living in Hollywood for a few years, World War II broke out and Cassini joined the army. He was stationed in Kansas, where he taught cowboys how to ride military style. Appropriately, the cowboys also taught him about style; until his death in 2006, Cassini wore cowboy boots every day. After arriving to the United States on Christmas day 1936, Cassini worked a quick job as a cartoon artist and then headed to Hollywood. One day Cassini was playing tennis and after winning a doubles tournament, his partner introduced himself as head of Paramount. He mentioned that he was looking for another designer. The next day, Cassini brought in his sketches and got the job! In 1941, the film, “I Wanted Wings,” debuted and so did Cassini’s Hollywood career! Over the next several decades, Cassini would design for leading Hollywood ladies. This included Rita Hayworth, Kim Bassinger, Faye Dunaway, Marilyn Monroe, Betty Grable, Natalie Wood, Renee Zellweger, Taylor Swift, and Joan Crawford. He also designed for his second wife, Gene Tierney, and later, for fiance Grace Kelly. 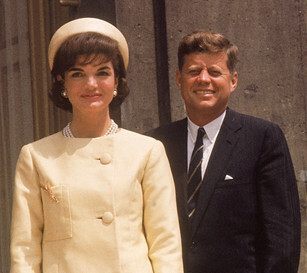 Cassini’s military style was apparent in Kennedy’s beautiful jackets. When we think Jackie Kennedy, we often think about her iconic “Jackie Look.” Even though some fashion critics made fun of some of the jackets with large buttons down one side of her bodice, Cassini loved this military-inspired look. Characterized by A-line cuts, knitted suits, and boxy jackets, the “Jackie Look” is now considered an important part of fashion history. That it is considered to be one cohesive look, is all due to the fact that Cassini insisted on it. Politically, Kennedy needed a designer who was American (he now was) but had foreign experience. Having designed for Hollywood actresses, Cassini was more than qualified. When the president claimed, “Cassini is army. I’m navy,” Cassini knew that he would be wanted in the white house. When Cassini met Jackie, she explained that she was planning to have a number of designers create her wardrobe and that she wanted Cassini to be a part of it. He declined the offer. Cassini explained that having multiple designers would prompt political battles between designers. Between this advice and Cassini’s talent, Kennedy chose him to be her sole designer. 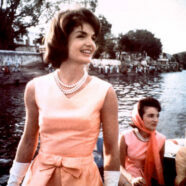 Kennedy worked with Cassini on her first dozen dresses. Once she knew that they were well received by the public, Jackie had him work mostly alone. However, the public soon was bothered by how much she was spending on her dresses, so her father-in-law, Joseph Kennedy, decided to pay for them. Spring 2015 Oleg Cassini gown. Courtesy of Brides. In 1989, Cassini received an honorary Doctorate of Fine Arts. He spent the next 17 years, taking good care of his body, designing, and dating at least one woman a lot younger than himself. He planned to live a lot longer than he did, but ultimately he passed away in 2006 at the age of 92 from complications of an aneurysm. His company continues to make fine quality clothing for women and brides around the world. but designing a wedding dress is perhaps the most special task. the most important moment, in the life of a young lady. and enters into what is hopefully a brilliant future.